Jenn Carrillo announced she is running for Karen Schmidt’s City Council seat. She even moved to the Ward just so she can take on Schmidt. Jenn runs on “Loving everybody” and “When We Fight We Win”. She’s really running against Karen because of the Welcoming Ordinance and the Council’s failure to pass it. Her comments below show she plans to fight with violence. Of course she deleted this post, but not before 21 people “Liked” it. Maybe the police should investigate who those 21 people were. Jenn obviously suffers from Trump derangement syndrome, the story is about Trump. Law enforcement needs to realize she has a dangerous mental disorder. Disagreeing with a president is different from threatening violence against him and his supporters. 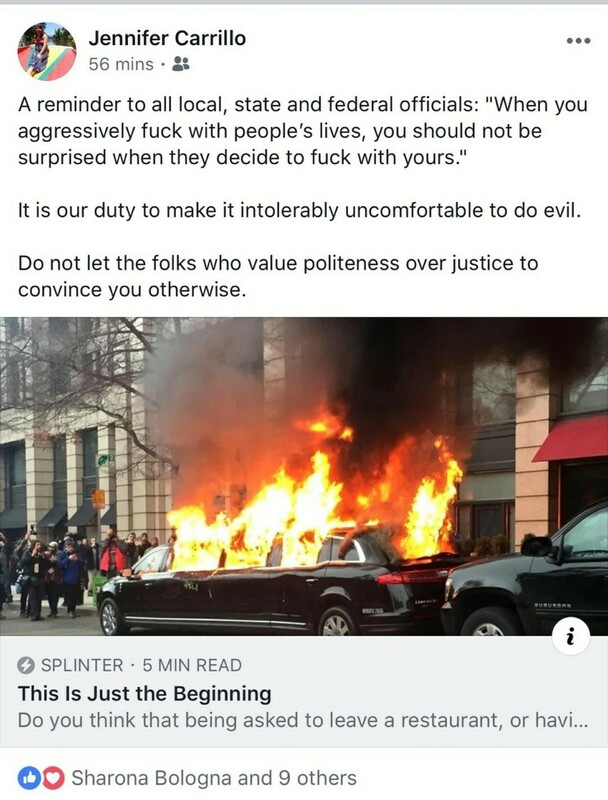 The left is calling for violence and now so is Jenn. The comments made by Jenn not only prove she is unfit to serve in government, she is a progressive willing to use violence to get her way. She can’t win on issues, progressives never can. They must threaten, name call, lie, and finally resort to violence to get what they want. Progressives are failing because the majority of Americans will not tolerate this kind of speech. Average Americans definitely won’t tolerate violence for any reason. Quit running for alderman Jenn, you disqualified yourself. This post will likely go viral. Jenn and her friends are violent people. Law enforcement needs to investigate her if anything happens to people who oppose her. We have a more radical progressives running for office in November. It’s only a matter of time before they show who they really are too. Please share before Jenn gets anywhere near the City Council seat. Posted in BloNo, Bloomington, BLOOMINGTON CITY COUNCIL, elections, illegal immigration, Local, Progressives, Renner.Tagged Jenn Carrillo, Karen Schmidt, trump derangement syndrome. Wow. Yes she needs to end her campaign immediately. Several years ago she was also involved with occupy wall street. Although they were peaceful in Bloomington the local group to the best of my knowledge never denounced the violence, rapes and riots that occurred around the country. ….and still she is employed by the local YWCA, correct? Maggie you gotta see the Jennifer Carrillo connection, Leaders of Distinction Awards by the McLean County Chamber of Commerce. Geez-louise, ya can’t make this stuff up! They’re all bat-crap-crazy! Another great piece for the opponents campaign literature. Hey Jenn you lose! If nothing else just because of this stupid post. LMAO at crazy libturds destroying themselves! Thanks to nut cases like you Jenn, red wave in November girl! Has she heard about Maxine Waters, soon to be ex-rep from California? So Jenn launched a GoFundMe page for cash to help her move to a low rent neighborhood?!? Karen Schmidt has been a poor representative of her ward ever since she went to work for IWU but this foul mouthed nut case would be 10X worse! WoW! Rule #1 for candidates=clean up or erase your social profile with exception of a campaign page. She failed. Foul language in a public forum shows lack of decorum. She fails, again. She claims to be an unadulterated progressive. She wins on that score. Sounds like Jenn will be the right fit for Tari. Betcha he endorses her. To have a foul mouthed progressive like her in a position of power is not only dangerous for the council but every citizen who believes in the rule of law and justice for all. How much historical evidence do we need that sentiments like “hate the rich” and “threaten those who don’t conform” lead to very dark places? The post is still up – maybe she blocked you. I didn’t get it directly from her page. Other people not blocked didn’t see it yesterday. It doesn’t matter if she took the social media post down. Screen shots of posts are just as damaging. Most people wouldn’t think like this in the first place. Sounds like she would have made a GREAT Hitler youth! They went for this kind of brain wash mentality..
@ Rich—Ditto for Renner. But the topic is Jennifer. Rich – The only “fascist tendencies” from Trump were invented by the foreign born spy Obama, Crooked Hillary and their lamestream media conspirators. Sorry that their weak attempt to overthrow the duly elected President has failed… NOT!!! “Does that excuse [her] post? … not yet.” Not Yet?!? So apparently Rich isn’t just a shill for the corrupt establishment, but domestic terrorist! Well said and great reply “Very Concerned Citizen”!!! Is it possible she had it set so only “friends” could see it? Does Jennifer realize that if she wins, her post authorizes and even encourages any business owner, taxpayer, or person that happens to be driving through town on our pot-holy roads to act (in)appropriately towards her and hers? You, as most of the current crop of social justice Bolshevik’s, need to brush up on your fascism spotting skills. Read the moonbat candidates post again. Who is it that is insuating that they are “coming for someone” ? And exactly who is it that the government has been f-ing with their lives? That’s right……taxpaying citizens who love the country and would like to be left in peace. To a certain point we are forced to accept that f-ing with….but definitely not from a fellow traveller. Your Niemöller quote is quite accurate but directed in the opposite of where it should be. Rest assured, if you all think the Weather Underground will be allowed a rebirth you are sorely mistaken. The progressive socialist tide has been somewhat stemmed and the pink hat wearing flotsam is not getting their way and the subsequent actions are showing who they really are. What their actual goals and methods are, what their “Co-Exist” bumper sticker really means. A sweet job of being “hoisted with your own petard” is underway. And yes, as Niemöller warned, you won’t be allowed to come for us. As the moonbat candidate put it, ” politeness over justice” won’t be an issue any longer. Her “duty” to make it intolerably uncomfortable to do EVIL??? Sounds like she could use an exorcism! WHERE does THIS kind of speech come from in ANY context? Nothing but HATE MONGERING from the get go! And she wants US to vote for her? BUt YET she don’t want ANYONE to do unto her! Maybe Rich can explain this one way attitude? Rich?? This is an issue with reading comprehension. The article spoke to the historical results of the rich disenfranchising the poor and the poor responding, sometimes intensely. That’s simply historical fact. Revolutions have consistently started after the poor are pushed too far. If you would like to see what a call to violence looks like, check out some of our president’s rallies. He said, “someone punch that guy, I’ll pay for your legal fees,” more than once. If you want to talk about inciting violence, look at Trump rallies. This article only advised caution that your chickens may come home to roost. Why is Jenn hiding then? I think you need to re-read. The article calls for attacking the rich because they are the criminals. You need a reading class and a basic course in capatilism..
Bull. It only has to do with rich and poor because that is how the socialist playbook says to dish it out to get the “useful idiots” foaming at the mouth enough to do the dirty work. This has to do with those globalists who want to end borders, language and culture and create a homogenous population to better control them and the wealth. The brakes are being applied on that train here and now finally in Europe. The article is just another perceived outrage pointed finger for the pink hats and soyboys to scream to the sky about. The average working stiff in this country has been robbed blind by government and Wall street yes…..the author was right about that. Problem is it was the average working stiff that put the current administration in, not the corporations and certainly not the swamp or the rich LMFAO. Folks took a last shot at preventing this place from becoming Venezuela and now it’s going to play out how it plays out. The best part is the “en masse” outrage part. It’s a mainly a few counties in urban areas where the useful idiots reside. The fake news does a pretty good job at making it look like “en masse” is the majority of the country to those snowflakes. If chickens come home to roost it will be theirs, not ours. If the little black mask and backpack wearing soldiers want to bring it, well, its all on them. Reading comprehension? How about, a picture paints a thousand words? The article you refer to conveniently ignores the fact that this current unrest through BLM & ANTIFA etc., groups are financed by the very rich (such as a George Soros types) that work to divide the people, poor vs middle class. The very rich play ignorance such as yours, yes you Blair, as it is the very rich who profit off of others strife. All wars are bankers wars, cause without the banks, no one has the resources to fight a war, period. Noting your second paragraph Blair you are attempting to justify the article by comparing it to Trump rallies. Lol. Two wrongs don’t make a right. Surely your momma taught you better. Typical liberal response though. Put the kool-aid down. There’s still time to wake up. “This article ONLY advised,,,.” No Blair, this article was full of the writers subliminal provocations. It’s too late to cover for Jenn, she blew it big time with that post as her chickens have arrived home to roost. Previous Post Is Tari lying?